Aussie, Aussie, Aussie! Oi, Oi, Oi! 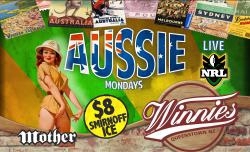 Come celebrate life down under as we pump the soundsystem full of Aussie Rock anthems... T-shirt giveaways, and tasty Aussie specials all night long. Plus NRL live on the big screen!